Have you heard of No Kid Hungry? Together we can end childhood hunger. I agree with them. One step at a time and one mouth at a time. We never know what child is going hungry or what child does not get breakfast. Proud to be a No Kid Hungry blogger and supporter. "Childhood hunger is a problem that threatens our children and our future. We're in danger of losing an entire generation of leaders, innovators and problem-solvers. But we are ending childhood hunger today. Please take a look HERE for more details on NKH itself and the amazing job that is being done to fight childhood hunger. The No Kid Hungry Chef's Cycle is coming up THIS WEEKEND! 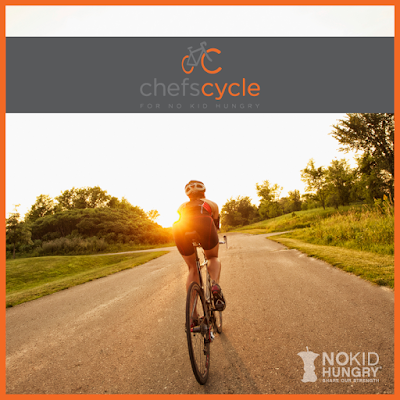 Nearly 50 chefs and restaurant industry professionals are riding bikes 300 miles to raise funds and awareness for No Kid Hungry. The West Coast ride happens June 14-16 and you can read all about it and even donate HERE . Want a fun way to get involved - Follow them as they ride - New York City to Washington, DC June 7-9 and Santa Barbara to San Diego June 14-16 - You can even see the Chef's profiles and more HERE and select a region to watch or donate to! I asked OnTheGoOCKid what it meant to make sure everyone was fed at school... her first reply was that - "It should be okay for the lunch lady to give a meal to someone who forgot it. Sometimes what if they don't have a meal or they really just forgot it." Wouldn't that be awesome if all schools could do that?! Think big and work to make it a reality. If 10 people donated 10 dollars that is already a huge chunk towards the fight! So, who will you be watching as they cycle to end childhood hunger, right here in the USA?! Good luck and THANK YOU to all those participating, volunteering and admin set up.